Love is important, but it is respect that is the key to your son's heart. The idea of moms respecting their sons may sound alien to some, but it seems to ignite curiosity across the board. It is easy to relate to the need for all of us to feel a mother's love, but is that the same thing as respect? Even for young boys, the effect of respect is nothing short of astounding when applied properly. What makes this all the more urgent is that moms are coaching fathers to love their daughters, but no one has said boo to moms on specific ways to show respect to their sons, at least not in a way that is applicable and fully explained. All realize that little girls need daddy's love, but who is strongly promoting the truth that little boys (and big ones) need Mom's respect? No wonder mothers feel left in the dark on this topic. 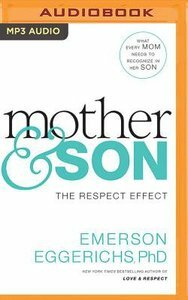 Just as Emerson Eggerichs transformed millions of marital relationships with a biblical understanding of love and respect, he now turns these principles to on eof the most important relationships of all--a mother and her son. About "Mother & Son (Unabridged, Mp3)"